AAATrade Review UK & Complaints 2019 - Safe or Scam? Demo? App? AAATrade is a fully regulated CFD and forex broker with a vision of becoming the largest investment firm in the world. This broker provides access to over 1,000 financial instruments through the renowned MetaTrader 4 platform. AAATrade is also a licensed by Liquidity Provider which gives them a unique standpoint on the market. In addition to offering CFD trading, AAATrade recently launched their own cryptocurrency exchange where you can trade over 50 different cryptocurrency pairs. In the review below you can read more about all of AAATrade’s innovative services and features. So, without further ado, let’s get started with our AAATrade review. We would give AAATrade a Triple-A rating if we could, but maybe it's not needed since it's in the name. Honestly, AAATrade is an excellent broker that one of the most varied selections of tradable instruments that we've seen in a long time. 1,000 assets spread across 9 asset classes means you have enough investment opportunities to keep you occupied for quite some time. And if that isn't enough you can always open an AAATrade demo account and start developing your own investment strategies. No, we have no reason to believe that AAATrade would be a scam. In fact, we have several good reasons that prove why AAATrade is not a scam. As always, we would never recommend a broker that wasn’t safe for our readers to use and the best proof of that is a license. In this case, AAATrade is regulated and authorized by CySEC, FCA, and BaFIN and that is more than enough to convince us that AAATrade is 100% legitimate. We like when brokers keep things simple, and we especially like when brokers opt for tested and established CFD trading platforms because the truth is that most proprietary platforms aren’t great. In this case, AAATrade has really kept it simple, and they only provide access to the MetaTrader 4 plus the MetaTrader WebTrader. 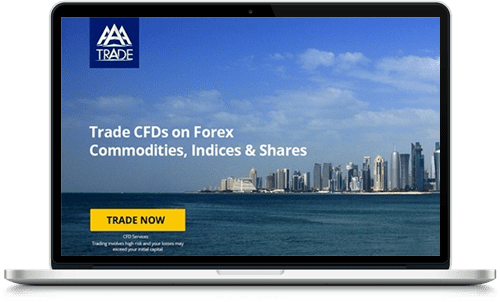 Now, the MetaTrader 4 is the best platform on the market, and it is definitely more than enough for the CFDs and forex pairs that AAATrade offers. What sets AAATrade apart from other broker is that they have developed their own cryptocurrency exchange, and we are really excited about this. The exchange is called the AAATrade CryptocurrencyExchange, and it provides traders access to over 50 cryptocurrency pairs. The MetaTrader 4 comes in a great and very practical mobile version that lets you use AAATrade wherever you go. The trading app is easy to download and available for both Android and iOS in the two app stores. In addition, you can also access AAATrade’s cryptocurrency exchange on a mobile platform, however, that service has yet to be optimized and we recommend that you trade your cryptocurrencies on a computer for the time being. What Assets Can You Trade with AAATrade? Shares – Trade on some of the largest companies in Europe, Asia, and the United States. Forex – Invest in both large and smaller currency pairs and make use of the largest market in the world. Precious Metals – Buy gold and silver as CFDs. Indices – With AAATrade you can invest in some of the world’s most influential equity indices. Indices Cash – This asset class is not very common among CFD brokers and we like the innovativeness of it. ETFs – Trading exchange-traded funds as CFDs has many benefits and we suggest you check it out. Futures – Trade commodity futures as CFDs and take advantage of one of the most popular markets in the world. Bonds – Invest in bonds from the US, Europe, and Asia as well as interest rates. Cryptocurrencies – In addition to the cryptocurrency exchange, AAATrade also offers a handful of digital currencies as CFDs. Today, AAATrade offers two different CFD trading accounts, and they both come in three different versions. The two accounts are called “Ready to Start” and “Experience,” and we think the differences between them are kind of self-explanatory. The three different versions of the two accounts depend on how much you deposit and they come with different perks. The most basic version is activated with a minimum deposit of $500, the second version requires a deposit of $25,000, and the third and most advanced version requires a minimum deposit of $100,000. In addition to the CFD trading accounts, AAATrade also has a cryptocurrency account for their cryptocurrency exchange. AAATrade has also worked hard to optimize the registration process, and you can be signed up and verified within three minutes if you have all the necessary paperwork ready beforehand. As if this wasn’t enough, the broker also lets you open an AAATrade demo account. The demo account is free and completely unlimited – if you need more virtual funds you can contact the customer support and they’ll top it up for you. As with all brokers, we encourage you to open a demo account even if you’re experienced since it can be beneficial when you want to try new strategies or practice without risking your own money. After you’ve signed up with AAATrade, you need to fund your account, and you now have nine options to choose between. Bank transfer – A regular bank to bank transaction. Credit or debit card – All of the most common cards are supported. Cryptocurrency wallet – Send money from your cryptocurrency wallet to your trading account. Qiwi – You can use your Qiwi wallet to transfer money. Neteller – This is a popular and very practical online payment service. Fasapay – Another online payment service that you can use. Skrill – This service rivals both Neteller and Paypal in terms of international popularity. UnionPay – Lately, these payment methods have become increasingly more common in the finance industry. In addition to a very comprehensive FAQ, AAATrade’s support team can be contacted directly. You can either visit their main office in Limassol, Cyprus or call one of their 26 local phone numbers. However, the easiest way to contact AAATrade is either via a live chat on their website or by sending them an email. To send them an email you have to use the contact form provided on the broker’s website. AAATrade is a great forex and CFD broker that is working hard at establishing themselves as an industry leader. Their excellent selection of financial instruments and dedication to offering a solid service is really admirable. However, what sets AAATrade apart from their competitors is their focus on cryptocurrencies. Not only can you trade cryptocurrencies as CFDs, but AAATrade has also developed their own cryptocurrency exchange. And since AAATrade is regulated, their exchange is one of few regulated cryptocurrency exchanges in the world. Also, if you already have a cryptocurrency wallet, you can use your assets to fund your account. Our point is that AAATrade is a good CFD and forex broker but they are best suited for traders looking to invest and speculate on the cryptocurrency market. i am trading with aaatrade years now, so I am familiar with their platforms, support and services and I am very very happy. While I made some cfd positions on cryptos, i am scared to try exchanging cryptos for sure. If there is any way ill do it, it would be through aaatrade, but has anyone actually tried? How do you like it?